Conspiracies, shady truths, cover-ups – if you haven’t experienced them somehow or other at work; you’d have seen them in some movie. The latest movie picture about crooked cops to hit the screens is David Ayer’s (Harsh Times) work. It comes as no surprise because the director also wrote the screenplay for the critically acclaimed Training Day (2001), another movie about crooked cops starring Denzel Washington and Ethan Hawke. 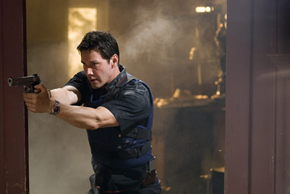 Tom Ludlow (Keanu Reeves) is an experienced cop who leads a difficult life after his wife dies. When a fellow cop dies and all evidence point towards him, he is forced to go against the righteousness he believed in his whole life and begins to see the true picture of things around him, ultimately leading him to see the true dark, dark world that is out there. Can you imagine Mr. Reeves (yes, we still think that The Matrix trilogy’s Neo was his best-played character in his acting career yet) plays such a demanding role? 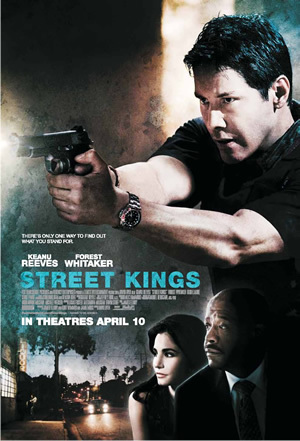 Surprisingly, it does not turn out as bad as we expected, because Reeves’ awkwardness does translate into the role rather nicely, and he manages to portray the tension and confusion faced by Ludlow throughout the movie. However, it is his co-stars who steal the show. Academy Award winner Forest Whitaker plays Ludlow’s shady boss with the expected but always enjoyable burst of energy. Watch out for his performance in the movie’s finale – it will blow you away. Hugh “Dr. Gregory House” Laurie’s scene stealing turn as a police captain may be brief, but the Golden Globe winner commands your attention every time he appears in a sequence. Then there is Chris Evans’ Sunshine, Fantastic Four) detective character which adds a fresh touch to the veteran cast. The movie is not without its violence, coarse language and a generous amount of blood, earning the picture its NC16 rating. Those who enjoy action-packed sequences with dosages of the abovementioned will get pleasure in the well paced shootout scenes which follow one another nicely. Although Ayer does not write his own script this time round, the story by James Ellroy (The Black Dahlia, LA Confidential) and screenplay by himself, Kurt Wimmer (Ultraviolet, The Recruit) and Jamie Moss follows the gritty style of the chronicling the shady lives of those living in the underbellies of the seemingly honorable and upright world. You may not find the genre fresh with your experience of watching similar movies (Asia’s very own Infernal Affairs trilogy comes to mind immediately), but you’d still be drawn in by the engaging plot that makes you shake your head in disagreement whenever an immoral character gets his way around things. Complete with a adrenaline filled music score by Graeme Revell (Aeon Flux, Planet Terror), a gritty cinematography by Gabriel Baristain (The Sentinel, S.W.A.T.) and tightly paced editing by Jeffrey Ford (Breach, One Hour Photo), the 109-minute movie turns out to be a predictably structured but entertaining ride. And yes, if female viewers are not die-hard fans of Reeves or Evans (we’d think they are the ones to qualify as heartthrobs here), this picture is definitely more of a boy’s movie.